University of Georgia Press, 9780820319278, 32pp. In this story of a spiritual adventure from the author and illustrator of Crow and Weasel, a young man journeys through the arctic wilderness to find a family of wolverine and learn more about their mysterious power. At the time the story opens the narrator is working as an airplane mechanic in northeast Alaska. Long sensitive to wild animals, he feels drawn to wolverines through his dreams. One day his work takes him to the riverside village of Eedaqna, where he meets an older man who is impressed by his integrity and his desire to make a connection with wolverines. The villager guides him into the Ruby Mountains to Caribou Caught by the Head Creek, a place where wolverines have a spiritual stronghold. Here the young man enters the dream landscape of two wolverine, and receives from them the first lessons he will use to shape his adult life. Barry Lopez's story, infused with gentle magic, shows how one man comes to experience the wondrous power of animals and to understand his place in the natural world in a new way. Tom Pohrt's watercolor illustrations add vivid dimension to the story, bringing to life the land, people, and animals the young man encounters on his journey. 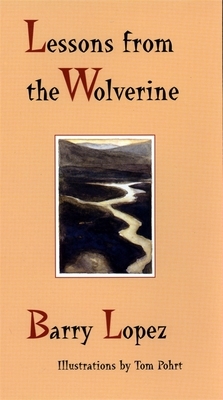 Lessons from the Wolverine depicts with stunning detail the texture and nuance of discovery and suggests the importance of a wisdom other than our own. Barry Lopez is the author of many books of fiction and nonfiction, including "Arctic Dreams," for which he won the National Book Award. He lives in Oregon. Tom Pohrt is a self-taught artist who wrote and illustrated "Coyote Goes Walking." He lives in Ann Arbor, Michigan. Lopez and Pohrt last collaborated on the "New York Times" bestseller "Crow and Weasel."